Air Sick: New York City Doubletree Metropolitan Hotel: "Small but Comfortable in New York"
New York City Doubletree Metropolitan Hotel: "Small but Comfortable in New York"
I recently stayed at the Doubletree Metropolitan in New York City for 2 nights on business. I really haven't picked a favorite hotel in New York and because of the wide range of rates I haven't been able to establish a favorite, rather a list that I prefer and book based on who has the best rate when I am in town. I have to say that this hotel is definitely going on that list. While I have never found my "perfect" hotel in New York, the Doubletree Metropolitan definitely beats out most I have stayed in here including such 5 star favorites such as the Waldorf Astoria. The hotel has apparently undergone a renovation because everything is very clean and new. I enjoyed the theme the hotel was going with. On check in, the staff were very friendly and helpful and continued throughout my entire stay. The staff at this hotel is some of the best I have experienced at any hotel in New York. The room, while small, is amazingly functional. 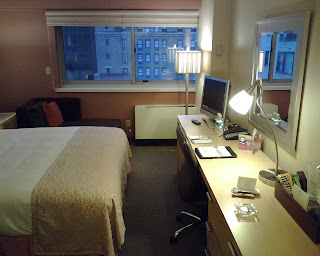 For those of you who have never been in New York, hotel rooms in the city are generally smaller then most cities (200-250 sq ft on average). Good hotels make good use of the space and this hotel is one of them. 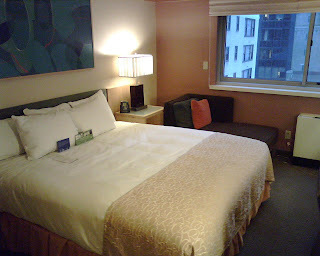 I had a king bed, small sofa, desk and stool in my room and felt completely comfortable. The only time you notice the size is when you stare at the walls (which for frequent travelers happens from time to time). The rooms furnishings all appear new and in very good shape. The bathroom is a nice size for New York with great pressure and hot water. The room had a plasma TV which you could swivel at the desk or in bed. Speaking of the bed it was very nice, one of my favorites this year. The climate control in the room worked very well, for those of you who like a cold room to sleep in, you will like this one. You can also crack the window for fresh air which I always appreciate when I start to feel hotel claustrophobic. The fitness center has plenty of equipment, both cardio and free weights and all are in good shape. Overall I would definitely stay here again. I was comfortable in the room and the staff were wonderful. I still haven't found my favorite New York hotel yet but this one makes the list of return visits.